Here is my May ornament, Merry Christmas. The design is by Glory Bee from the JCS 10th Anniversay Collection. I decided to stitch it over one on 28ct Platinum Cashel, and although was a bit hard on the eyes and meant I need my magnifier, I am very pleased with the reult. I substituted all the colours except the green. I really didn't like the GAST Claret that was used for the words "Merry Christmas", so used DMC 115, which is, in my opinion, a much better colour and blends well with the others, which are a combination of WDW and GAST. It's not finished off into an ornament yet as I need to gather supplies for that. I'll probably have a great finishing off session. later in the year. If I EVER get this posted it will be no small feat! I keep hitting a wrong key and backing completely out of my post! Anyway, here is Celestial Santa, by Pat Thode of HeartStrings/The Artists Collection. 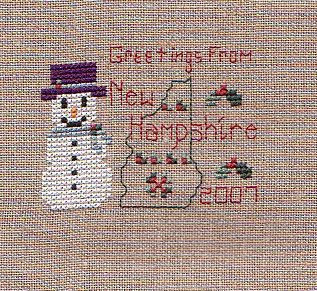 It doesn't look exactly the same as it does in the 2004 JCS Christmas Ornament issue because I received the materials to stitch it from a club I was in a few years ago. I ran completely out of the red and had to change the hat to blue, which I think gives him a more patriotic and less celestial look, LOL. He is more glittery IRL than in the scan, the bottom of his coat is stitched with a red metallic fiber blended into the GAST fiber, but it doesn't show in the scan very well. I like the overall look, though, and this fabric was dreamy to stitch on. I like the sort of denim-ish feeling it has. The bells don't ring, much to my 8 year old daughter's chagrin. He's kind of big, so I'm thinking of making him into a pillow. The quilt store in my neighborhood had a really cool dark blue fabric with stars on it last time I was in, I think I'll have to go back and get a cut of it. My 7th ornament for Christmas 2007, but only the first that will actually be a gift. 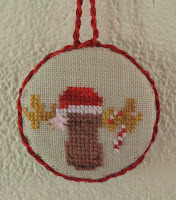 This is a freebie from The Stitcher's Habit for any other moose-aholics out there. I made this for my sister, who actually has a coffee table in the shape of a moose. (She's got it bad! LOL!). 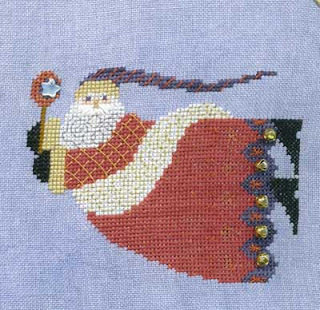 Here is my May contribution to the Ornament Stitch-A-Long - Santa Keeper, a freebie from The Drawn Thread. I went with something quick this month as time was an issue. :-) I love what everybody is doing! Bravo! I've stiched these three ornaments just in one evening! They are very easy to make. I glued them on cardboard and made cording with the same color used for the stitching. They were Christmas gift for dear friends. This is my second May ornament. It's Alphabet Tree, an old freebie by The Prairie Schooler. 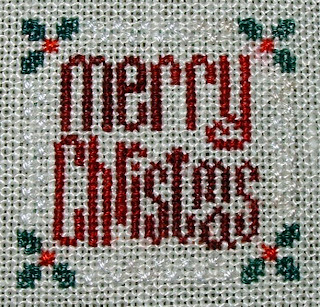 I have stitched it on a 14ct cream aida and used the Carrie's Creations' Joy Noel thread for the alphabet, DMC 500 and 666 for the backstitch. I've used a Victoria's silk ribbon named Autumn Leaves to hang it. It was very quick and funny to stitch! The back fabric is a Mumm Winter Whimsy Reindeer Frolic on tangerine. 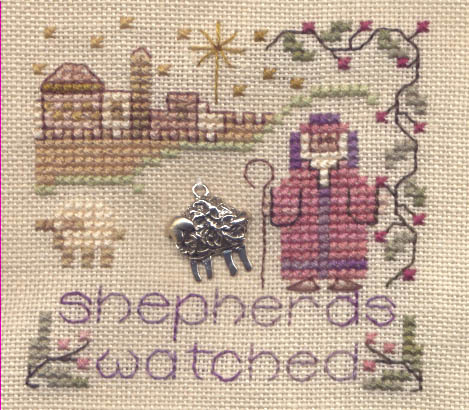 Here is Shepherds watched by Shepherds Bush, my ornie for this months Stitch-along. 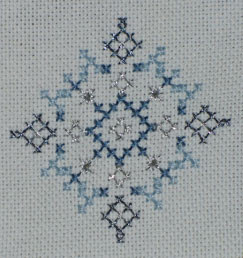 The design appeared in the 2002 issue of Just Cross Stitch Christmas Ornaments. I haven't stitched any SB designs for a while so it has been nice to spend some time working on this piece. Stitched with the called for fibres on an anonymous piece of 32 count. I liked to finish this design with this tecnique that I call 'Raviolo'. It's a good way for giving more importance to the stitch. The picture's not quite as clear as I thought *lol* but I finally finished another ornament! 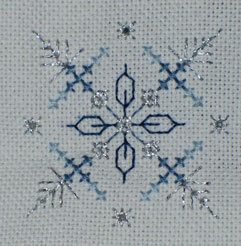 This is Cherished Stitches' from the 2006 JCS ornament issue and is for an ornament exchange. Here I am, for one of my erratic and irregular appearances. 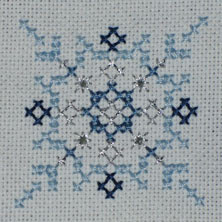 I just finished Tanya's freebie into an ornament - forgive the hasty photo, it does look better IRL. 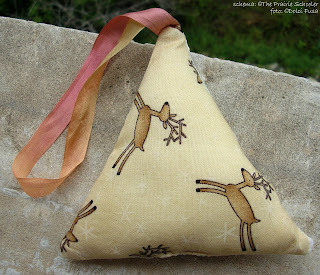 ;) Astonishingly, I'm up to six ornaments - all thanks to this blog! HEART IN HAND CHRISTMAS TREES. As you liked the one from Carriagehousesamplings, I'm glad to show these too. hey are all Heart in Hand designs, I made little fobs with cording then I used a pin for hanging them on little hand made trees by my sister. This is my May ornament. It's House on Holly Hill, from the book Peppermint and Holly by Blackbird Designs. I have stitched it on a 28ct Cashel linen Fern from Silkweaver and used the Weeks Dye Works threads requested, but changed the word on the left. The back fabric is a Kogut Wintertime Friends Labels Multi on Tangerine. DMC and Weeks Dye Works threads. Hello, I am Marisa and I'm new to this SAL. Not new to stitching ornaments, definately not new to that! I'm not sharing my most recent finish, but I am sharing one of my favorites. Last year I participated in a automatic shipment program with an online LNS I frequent. She was shipping small ornament cuts from the 2004 JCS ornament issue, and sending her own hand-dyed fibers to complete the ornaments. This was one of the first I received, and I absolutely love the colors she chose. 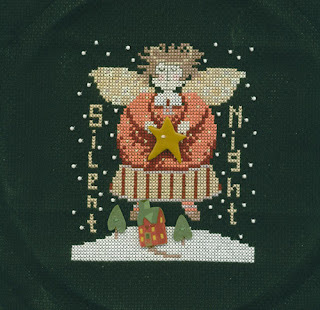 This is Silent Night, by Imaginating. A link to my blog is listed on this site, and I also have a gallery at Cyberstitchers (Marisa's Stitchworks) where most all of my stitchings are posted. Thanks for letting me join! This is from a series of Carriagehousesamplings designs, I took this ornament and finished it as a 'Christmas tree' in a little pot. Snow Joe by Heart in Hand Needlearts. 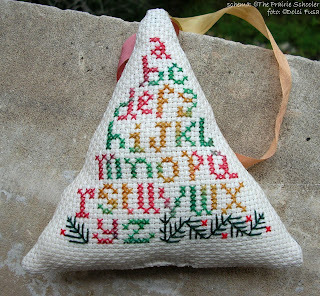 2000 JCS ornament issue, done using the recommended sampler and weeks threads. I enjoyed myself a lot stitching and finishing this star, it was a little bit long to fill all the fabric but at the end the result looks nice. A little late about posting this! I found the freebie pattern at Michaels. This is my first christmas ornament ever and I made it as a present for a stitching friend. Some of you may recognize it from 2002 JCS Christmas ornie magazine. It is the Christmas Rose by Elizabeth's Designs. I changed the colours and didn´t do all of the stitches. This another of my favourite I put it in this little heart wreath and I gave it away as Christmast gift last year. 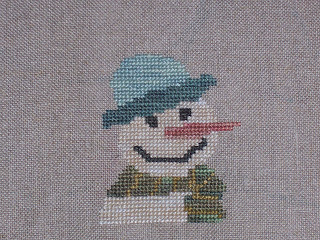 The missing threads arrived so I finished stitching this during the April ornament weekend, but it took until today to stuff it. It was all worth it. More information about the finishing techniques posted here on my blog. I enjoyed myself too much stitching this LK design, I gave it away in a Christmas market many years ago. I made it on floba with Sampler Threads . I know I'm bad, I don't stick to the SAL dates I just stitch my ornaments when the opportunity presents itself. 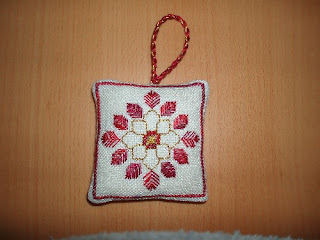 Yesterday I stitched three ornaments! 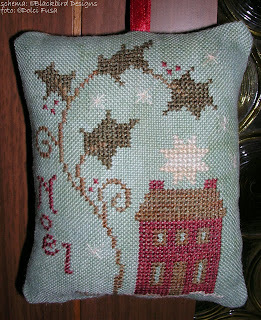 I used a linen band for this little pillow, the design is from an old Drawn Thread JCSCO . I put red linen on the back, it was a very easy finishing but nice effect. I think, you all know this design, but I love it! 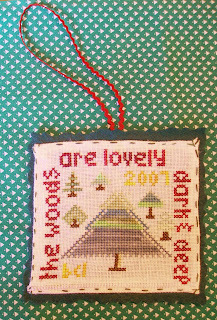 (Little House Needleworks , Just Cross Stitch 2004 Special Christmas Issue) I used the recommendet Anchor-threads and a cashel-linen. Thi's an Heart in hand design, I just loved so much using different stitches on it. I put lavender inside together with the stuff and the little vintage button was really the perfect touch. Here is my March ornament, I am little behind as you can see. It is noel birdhouse by Brittercup Designs. It is from the 2004 ornament issue. It is missing the little bird button near the opening. It's on order, and I did it on sparkly white fabric instead of the summer khaki the pattern called for. Now onto the April ornament. I will catch up! I had this piece of Graziano linen who told me:" stitch me please!" So what shall I do!??? 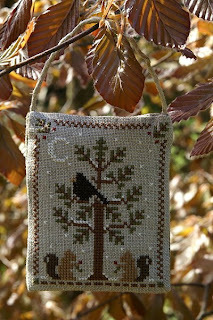 I stitched it, and I finished it as a little sweety bag. by Elizabeth's Designs from 2001 JCS. 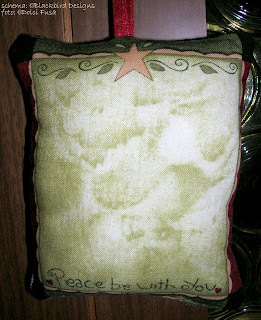 This is another EEF ornament, I finished it like this.. hanging on a little" wood stair".